Welcome to January’s Newsletter everyone! I hope you all had a wonderful Christmas and New Year’s celebration. New year means new beers here at Just A Taste. Our newest additions have made their way in to the store in the last couple weeks; Bell’s Expedition Stout 2016, North Coast Old Stock Ale 2016, and North Coast Old Rasputin Imperial stout. This month we will visit one of the above-mentioned beers and the second beer will be another beer that is new to our market. I know I’m thirsty, and I bet you are as well, so let’s get in to these beers. Prost! 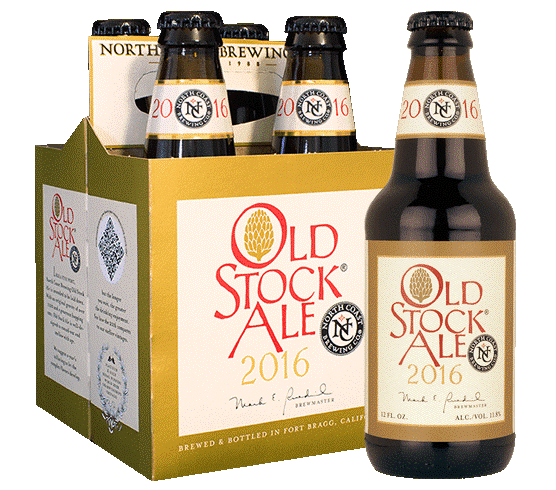 First up is North Coast Old Stock Ale ‘2016’. An “old” ale is an old English beer style. Pubs would buy barrels of a young ale, and save some back. They would then blend a new barrel with some of the old beer, to the patrons taste. It wasn’t until much later, that breweries decided they would do the same thing; hold back beer then sell it to the pubs for an increased price. Most were in the 6-8% range, but many American styles clock in above 10%, which is the case with this one. It comes in at a whopping 11.8%! I poured this beer in my Teku glass (Which, if you don’t have one, you should! It is my favorite multi-purpose beer glass. Set aside your frosted pints and give one of these babies a try! Regardless, it makes your beer look sexier!) and it looks awesome! It pours a dark amber, copper color with a little bit of thin, tan-white head that quickly dissipates into a very thin collar. Big heavy malt notes burst from the glass with a back note of figs and fruit-laden bread. No hop aroma is readily detectable. On first tasting this one, it has a more viscous body and a noticeable sweetness that is nicely balanced by some earthy hops. The booze is noticeable in the finish both as a warming sensation and as a little burn in back of the throat. The finish begins bitter, then the alcohol crosses over, then chocolate notes move through with a final malt sweetness that hangs around for a quite a while. I wouldn’t say this beer has a cloying sweetness, but it is right on the edge. Of course, if you let this cellar for a while, some of that sweetness will dissipate and the beer overall will become drier and have some savory characteristics that start to show. Next up, is “The Commodore” from Ballast Point Brewing in San Diego, California. This one is labeled as an American Stout. Inspired by English and Irish stouts, the American Stout is a spin-off of these styles. Usually having a large hop bill, or having coffee and/or chocolate added to balance the roasted malt flavors, or aging in barrels, the US has taken a known, and loved ale style and certainly made it its own. As you can see, this beer pours midnight black with a fluffy, dark tan head. The head persists and makes gorgeous lacing as you drink; a sign of a truly well-made beer. Right off the top, you get a nose full of dark roasted malt. It smells like a fresh cup of coffee. The body is light and drinks super smooth. Again, not much in the way of hop character, but the finish has a nice roasted bitterness to it. For me, this beer won’t last too long. I’ve been looking for a nice light stout that isn’t Guinness, and here I’ve got one. At only 6.5%, this beer can be easily enjoyed one after another.